WOW, was I ever surprised to have received what appears to be the new mystery coin!!!!! I opened the package and what do you know I had been bitten. 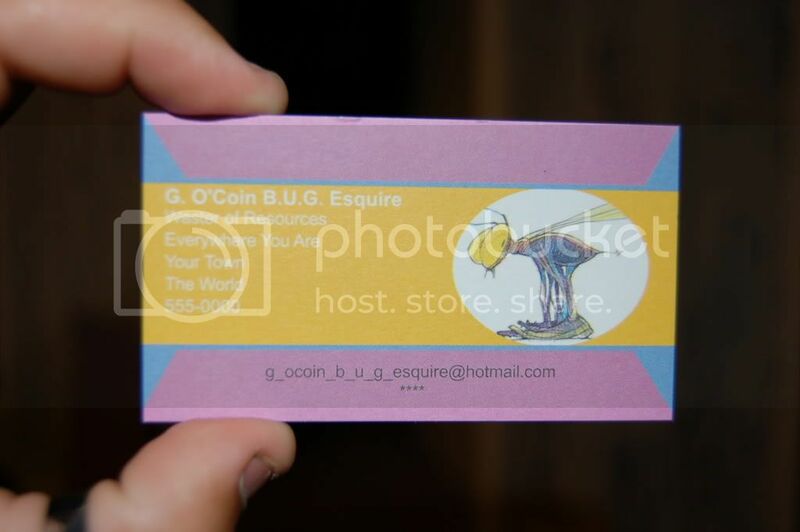 A huge thank you to the Geocoin Bug, I really appreciate the new gift. Now, that is a bug bite I wouldn't mind getting. LOL Very cool! 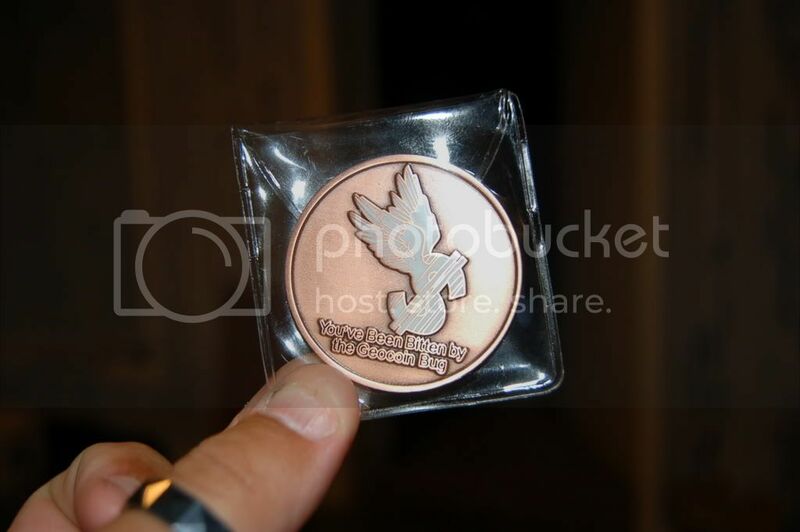 Do have to say that is a cool looking coin. Perhaps I could crop these pictures a little , I was just a bit excited to post my new find!!! I may not have the coin to prove it but I sure have been bitten too. Very nice...Has just the right bug spay for those too...called sharing. 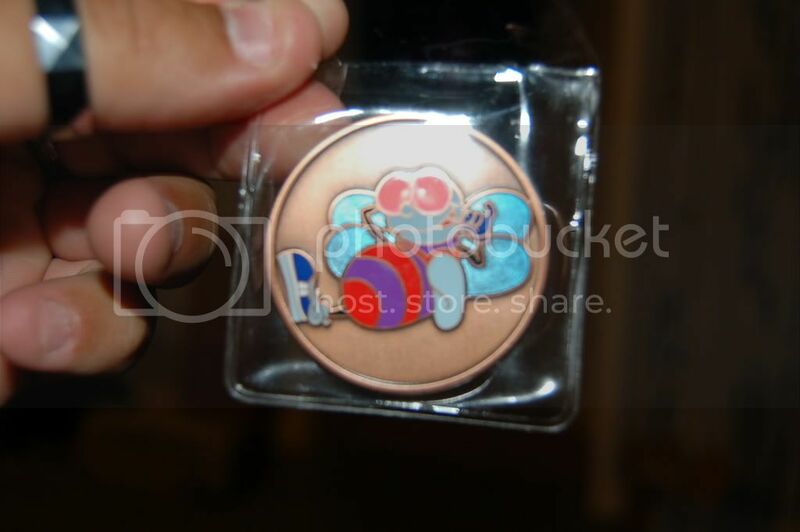 That's a very nice coin. Congrats to you. Very nice coin! And very cool calling card! I am always amazed by these gestures. How do you get a mystery coin? Are they really a mystery? Do you really not know where they came from or who sent them? How does the mystery person get your address? Hummmm. . .you are from Utah. . .the post mark is from Utah. . . I love the Bug's little Shoe in the middle of the coin, as if he's lying against the coin itself. A beautiful new mystery coin! Very kewl . . . congratz D! Cute coin. Congrats on your gift. I have to admit I really have no clue who sent it, I have my guesses!! As for my address I have done many trades, so my address is out there. Not to mention look at the picture of the envelope!!! I am trying to make it easy for the next person to send me a coin ! 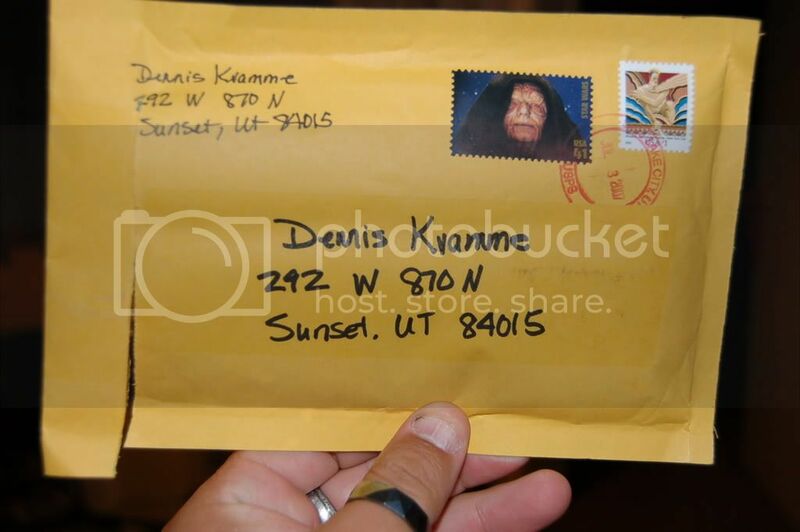 As for the postmark in Utah, I promise that does not mean anything. Those who have been involved in these "mystery" coins no what I mean . Sure hope the bug has my address, otherwise if it would email me, I'd gladly give it to him/her!! I love these mystery coins. They are so fun. Can't wait to watch this thread and see all the joy it brings to everyone. Very cute coin, Dennis. I am sooooo jealous! BTW, did anyone else send an e-mail to that address? Boy! Does that coin hit home for us coin-o-holics! Congrats on the coin Dennis, now if you want me to wear that around my neck we will have another deal. Well, we will have to see how much weight I can add to this coin first . Maybe 3.5' of 1" chain ? 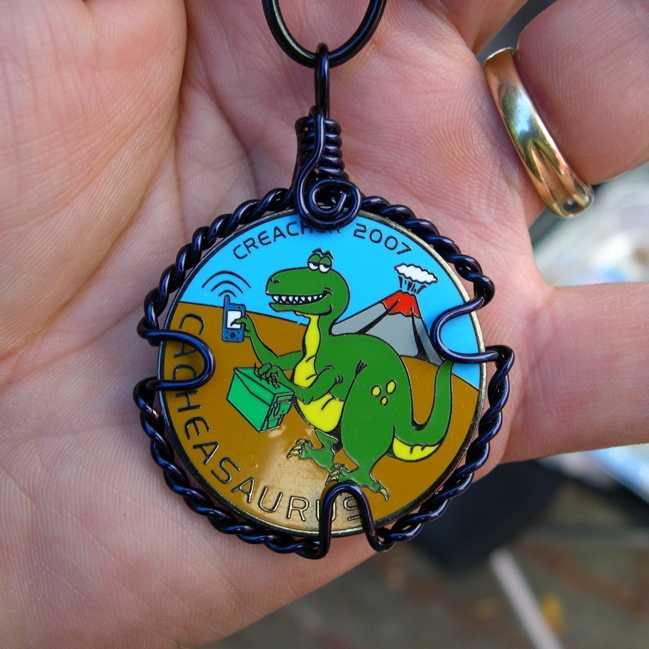 Will need to talk BooBoo out of the Easter coin, that would look nice wire wrapped. No I do not mean to keep it either it is hers, but I am sure she would be happy to display it with the others . Too cute! After spending a few hours getting bit by mosquitos, this is one bug I wouldn't mind getting bit by! I often wonder what I have done to deserve this ? I have stopped wondering, and trust me you will not find me complaining ! That's a hoot Dennis! Highly appropriate for the more afflicted members of the community . I'll have to check and see if my PayPal account is showing signs of redness or irritation . Too cute... what a nice surprise. CORNgrats D. BTW...WHERE did it bite you? Wow, that's great. Congratulations on being bitten; and on such a great gift. I'd love to get a bite myself. I wonder if there's a spray to attract a bug . Wow! Now that's one bug I would not mind being bitten by...I better start laying off the bug repellant. I've always said that I will be the first cacher to get the mosquito disease (my brain isn't working this morning). Nice coin...what does the back look like? You do always seem to have luck on your side when it comes to these "mystery" coins. Congratulations Dennis!! That is awesome!!! And a new mystery coin to be on the lookout for. That's so much fun. As Paris Hilton would say "That's HOT!". Congratulations Dennis - you deserve it! CONGRATS!! If you have to get bitten, that is CERTAINLY the bug you want to get butten by! LOVE it! LOL!! Time to cover myself in honey to lure the GeoBug in !? Ya know what, you are right! That was a great idea! How clever of you! AND HOW LUCKY! Again, awesome coin! Congrats! What did you mean, "Those who have been involved in these 'mystery' coins no what I mean"? I will be emailing you probably tomorrow to discuss the plans to make this happen. I am hoping to make it worth your while . Lets just say that is part of the mystery . Congrats Damenace! I hope to get bittin by that bug as well as the others here! If you notice the Geocon bug by our area, be sure to let me know again!! Very cute coin! I like the little bug so long as he doesn't bite too hard! Its not the heat, its the humidity. I am in for Vegas anytime. We were just there and drove around in a convertible in 105 degrees. Besides the casinos are air conditiond. Cool! I Love Mysteries. err Mystery Coins.